dhokla in microwave | instant dhokla recipe | microwave gujarati dhokla with detailed photo and video recipe. a simple and tasty vegetarian snack recipe form the gujarati cuisine prepared from chickpea batter. 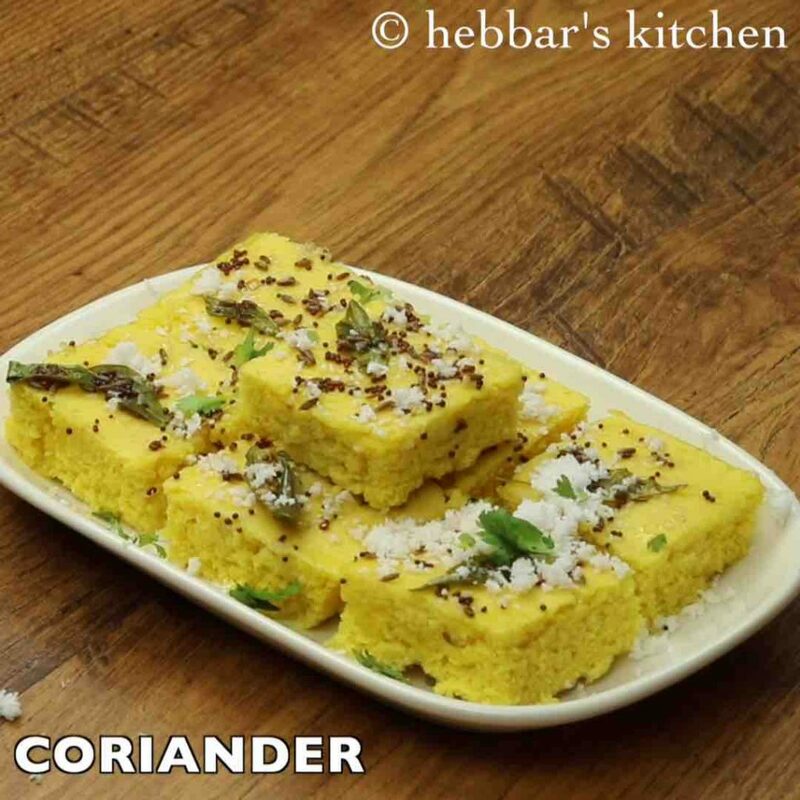 typically dhokla recipe is prepared with fermented chickpea or besan batter in a dhokla steamer or perhaps in cooker. but this recipe is unique and handy as it is prepared in the microwave. dhokla in microwave | instant dhokla recipe | microwave gujarati dhokla with step by step photo and video recipe. 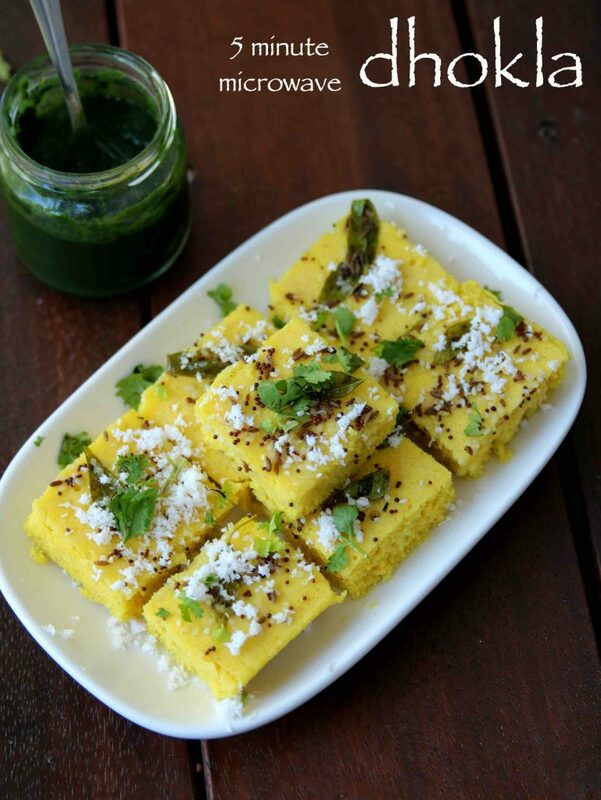 dhokla recipes are very common and a popular snack food for many gujarati’s and also many indians. with its popularity, it has been subject to a wide range of recipe variations and its preparations. the easiest and quick way is to prepare it with microwave and can be prepared within 15 minutes. 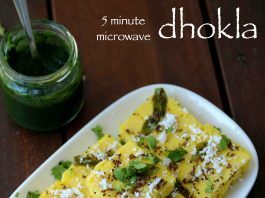 i have posted quite a few instant recipes till now but i guess instant dhokla in microwave is my first microwave recipe. i typically prepare dhokla in a steamer and i personally recommend that option if it is accessible. however, occasionally you may do have access to a steamer, cooking stove and perhaps even a proper kitchen. especially during travelling and in hotel rooms you may have access to the only microwave for heating processed and ready to heat food. this instant dhokla recipe is ideal for such situation and can enjoy the fresh and healthy food. moreover, in this recipe, i have also shown how to prepare the tempering in the microwave for dhokla. hence it can be really handy during your next travel arrangements. 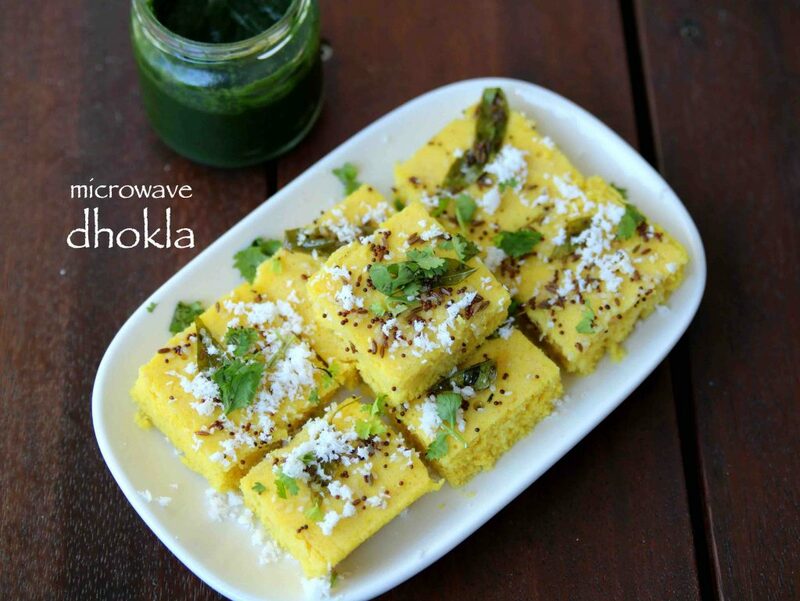 furthermore some important tips, suggestions while preparing dhokla in microwave. firstly, i have prepared this dhokla recipe in a 1200W microwave and hence the heat intensity would be more. 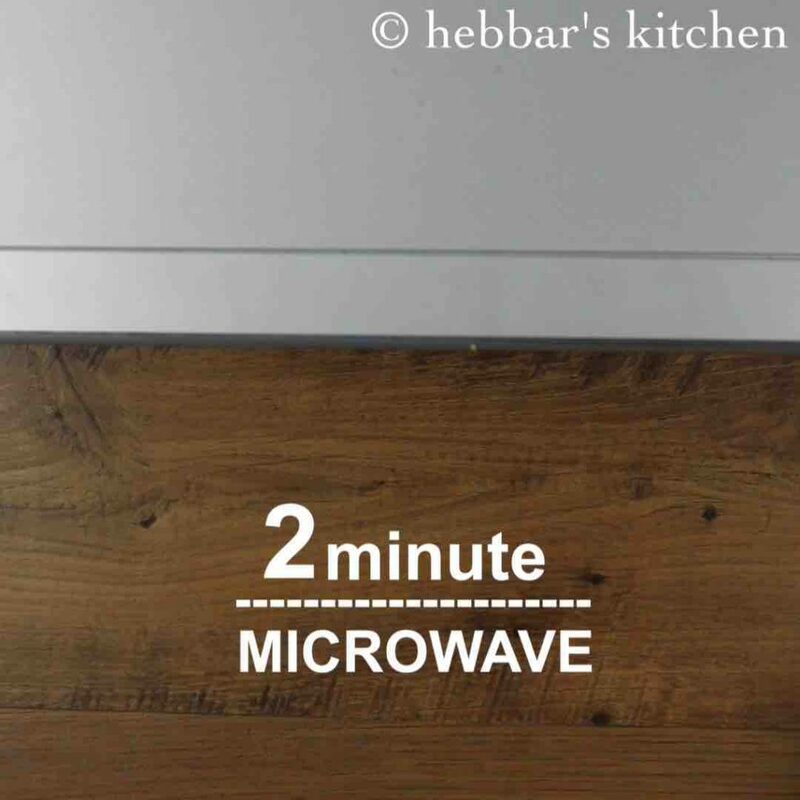 check your microwave intensity and watt and accordingly, you may have to alter the cooking time. secondly, i would heavily recommend using eno fruit salt to hasten the fermentation process. 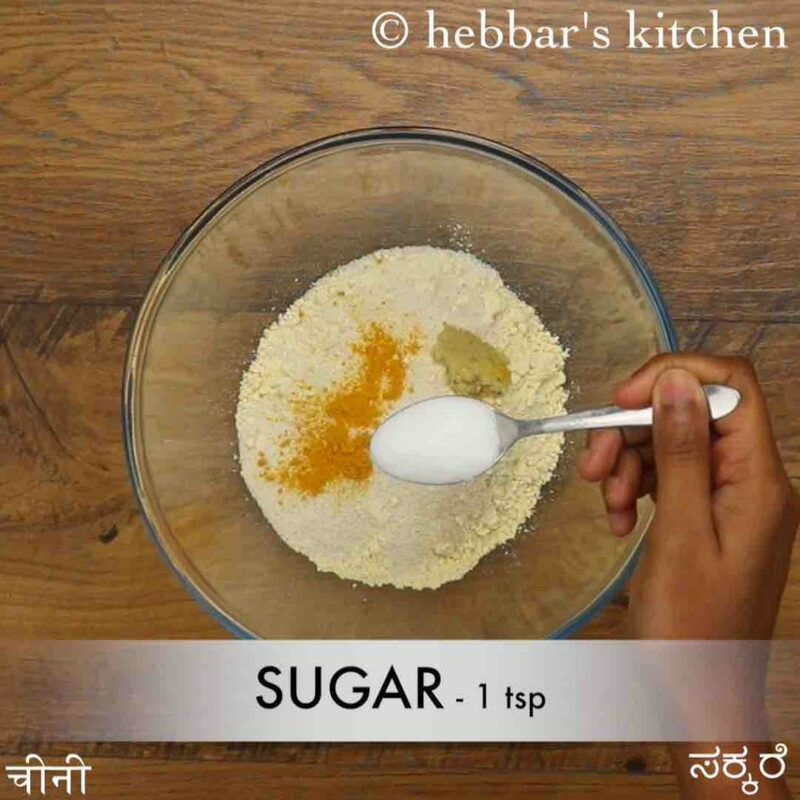 avoid baking soda as it may introduce the pink or red colour to your instant dhokla recipe. lastly, you can use the same quantity and proportion to prepare the dhokla in gas stove via steam cooking. 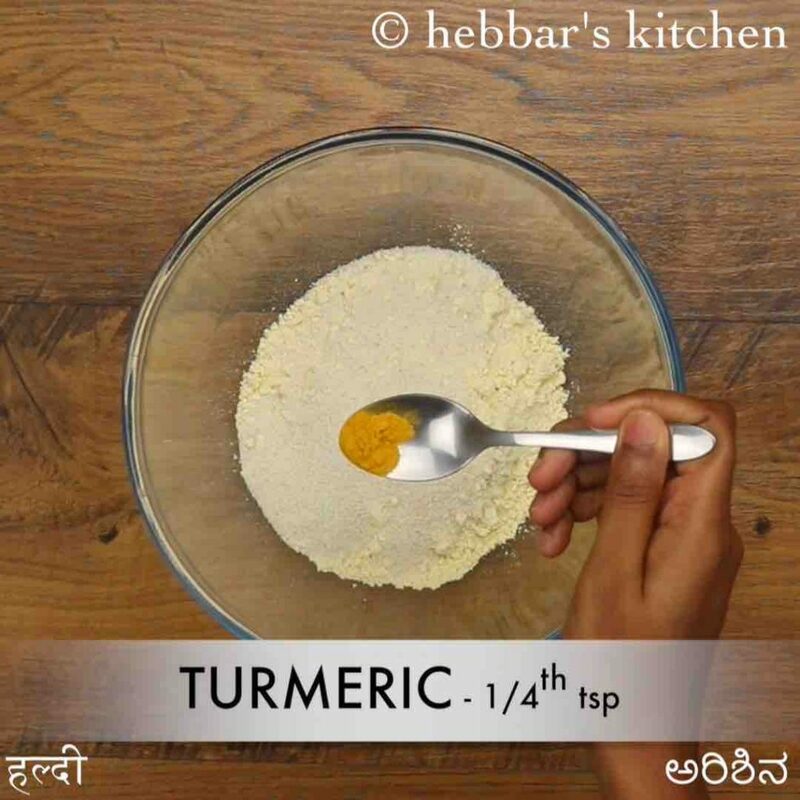 firstly, in a large mixing bowl take 1 cup besan, 2 tbsp rava and ¼ tsp turmeric. also add ½ tsp ginger paste, pinch hing, 1 tsp sugar, 2 tsp oil and ¼ tsp salt. 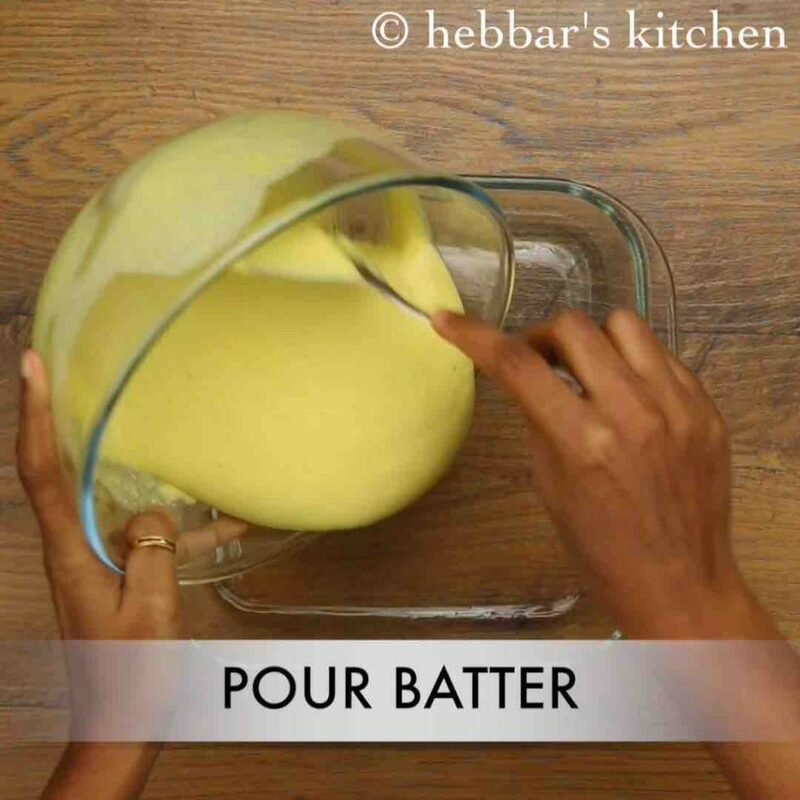 add ½ cup water and make a smooth lump free batter. allow to rest for 10 minutes later add a tsp of eno fruit salt to batter. 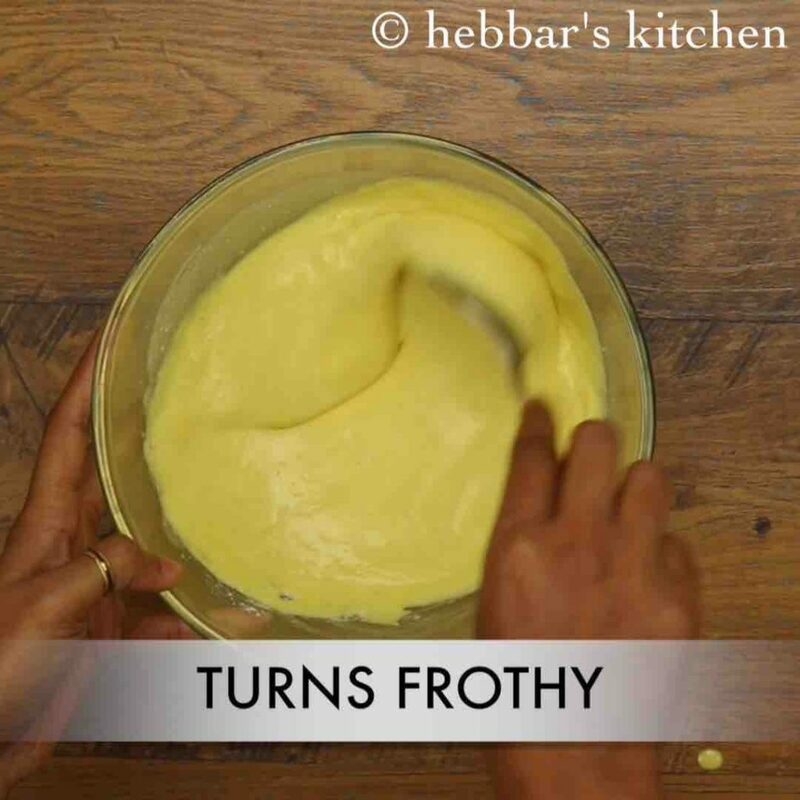 mix gently till the batter turns frothy and light. 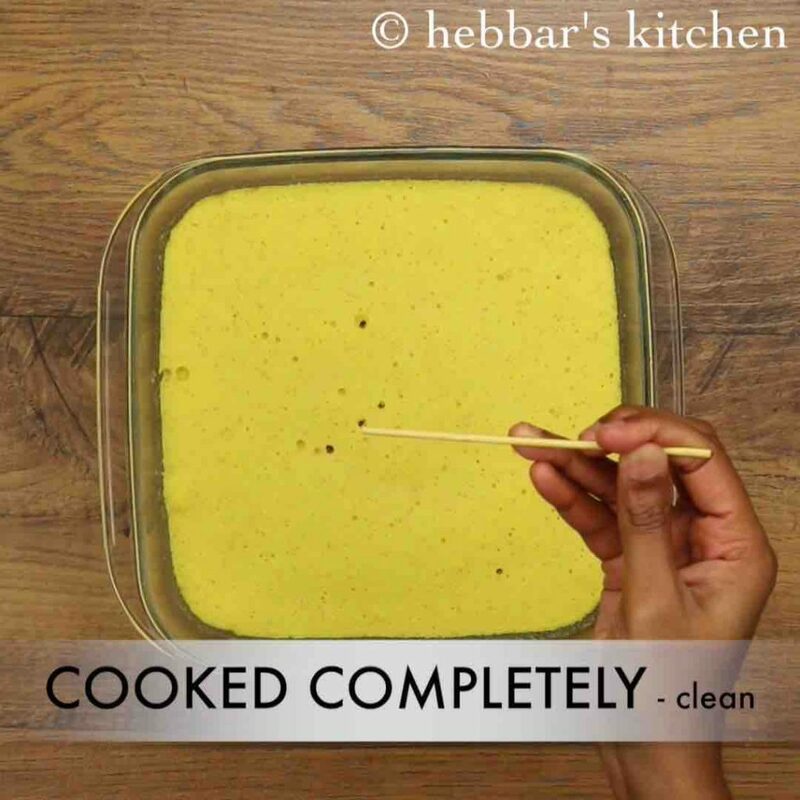 transfer the dhokla batter immediately to greased tray. place in microwave and turn on for 5 minutes on high power. 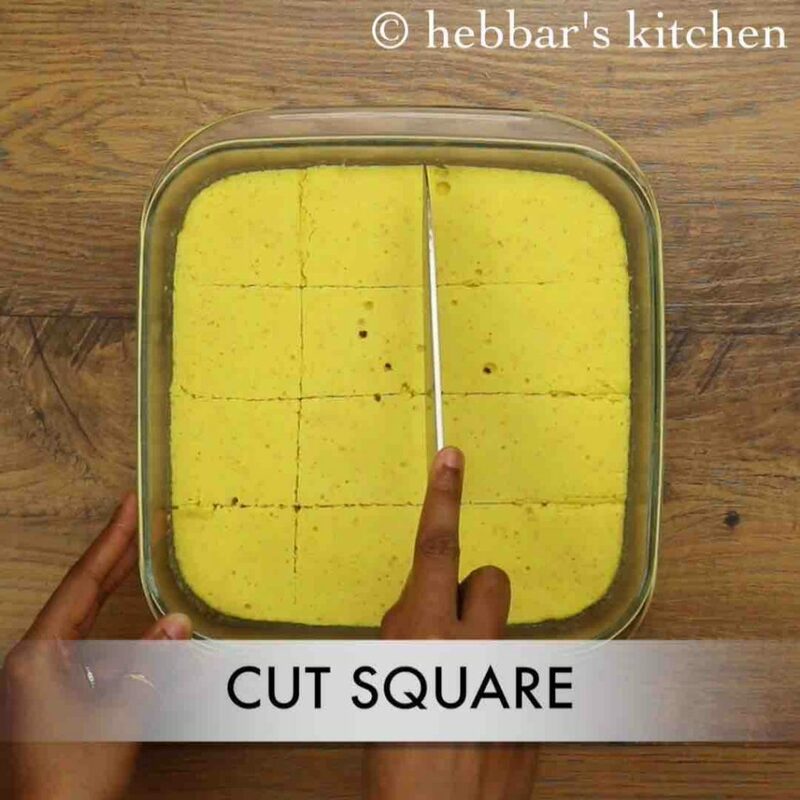 cut the dhokla into square pieces or shape of your choice. 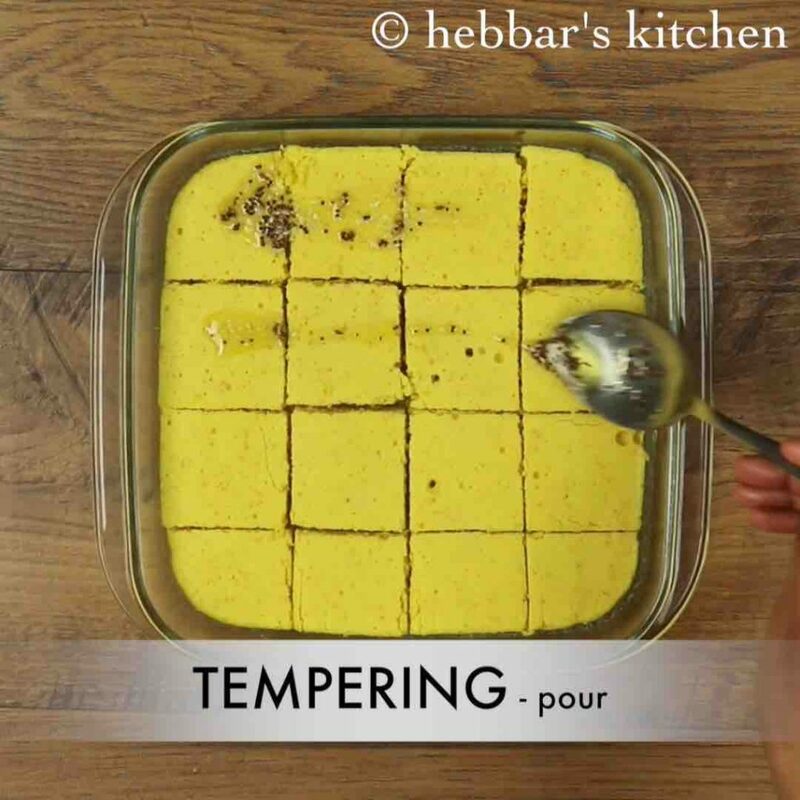 pour the tempering immediately over the dhokla making sure it absorbs completely. 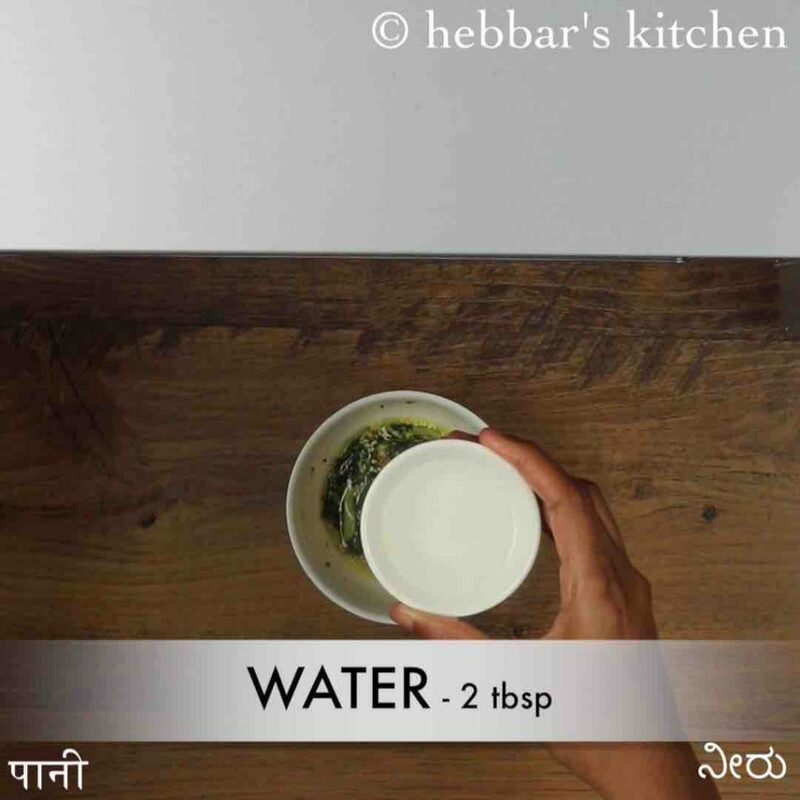 further sprinkle 2 tbsp coconut and 1 tbsp coriander. finally, serve soft and spongy dhokla with green chutney or as it is. 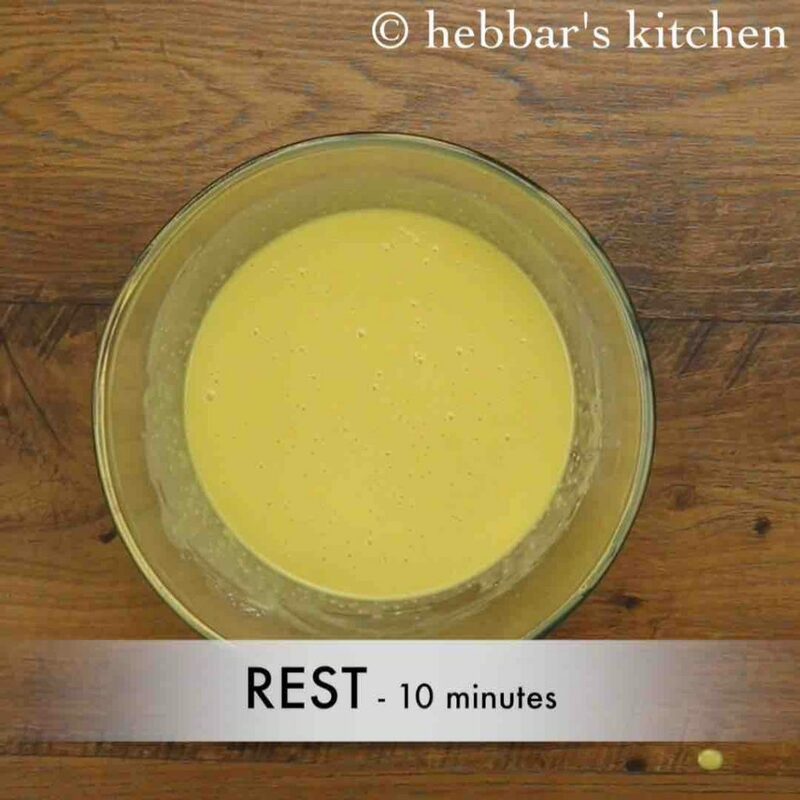 also add ½ tsp ginger paste, pinch hing, 1 tsp sugar, 2 tsp oil, ¼ tsp salt and 1 tbsp lemon juice. 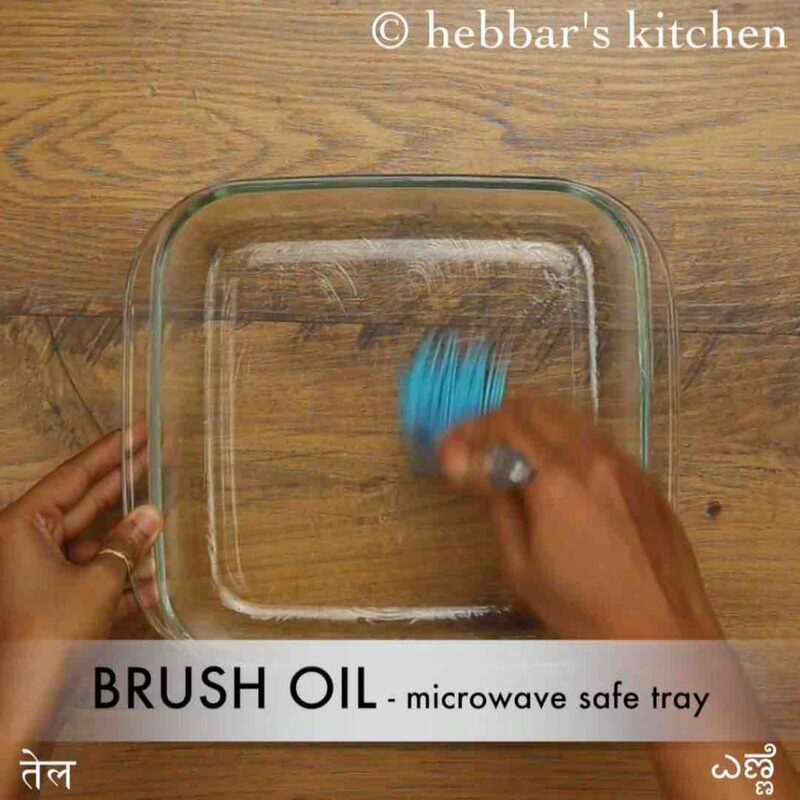 meanwhile brush the microwave safe tray with oil and keep aside. after 10 minutes, add a tsp of eno fruit salt to batter. place in microwave and turn on for 5 minutes on high power. alternatively, to steam in steamer check khaman dhokla recipe. 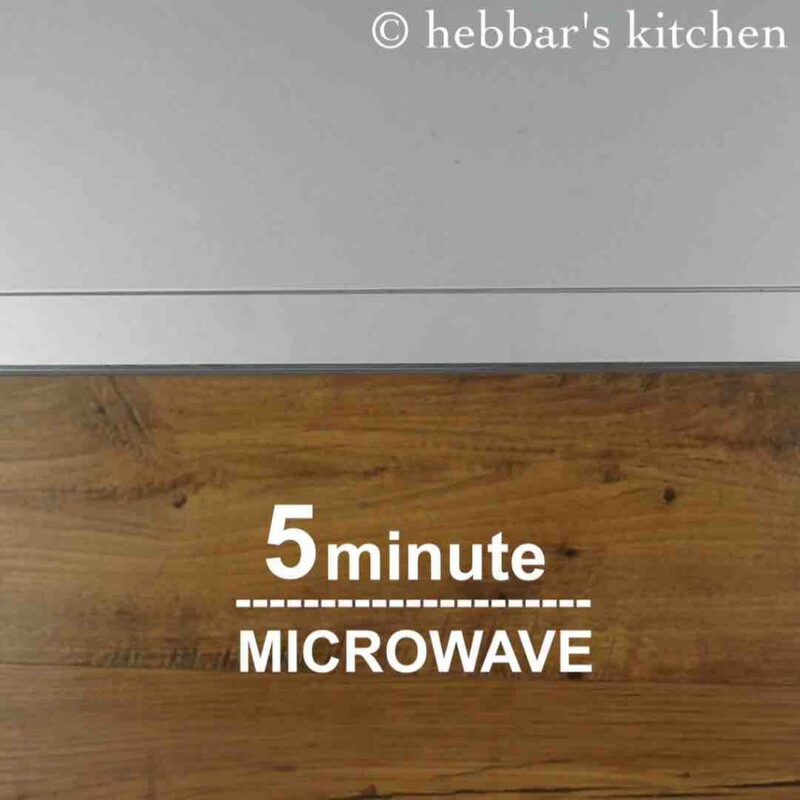 make sure to poke toothpick and check if it has cooked completely, else cook for a minute again in microwave. 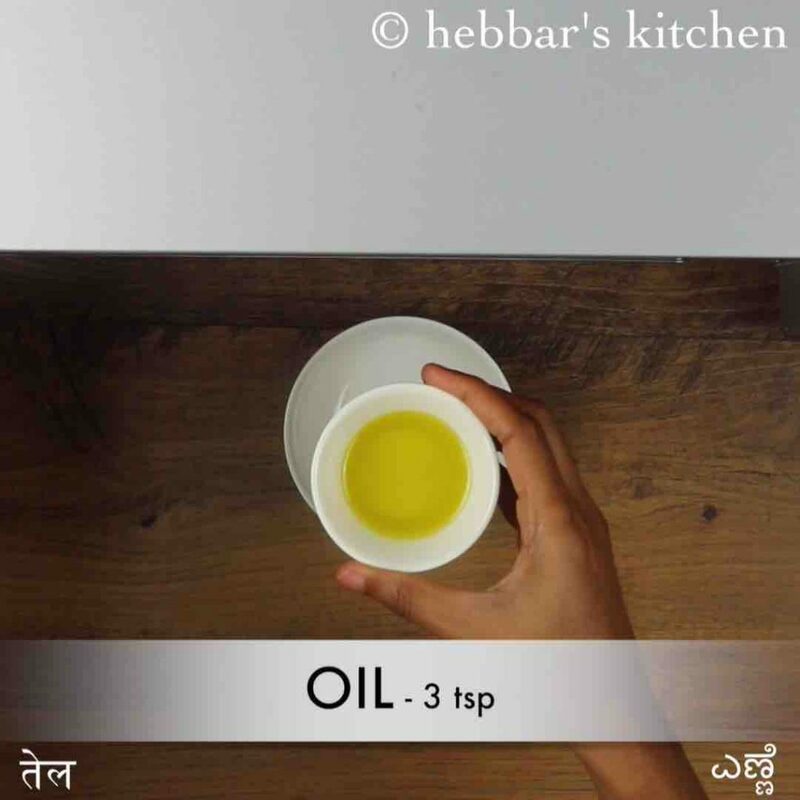 heat the 3 tsp oil for the tadka in a small jar for 2 minutes on high power in microwave or on kadai. 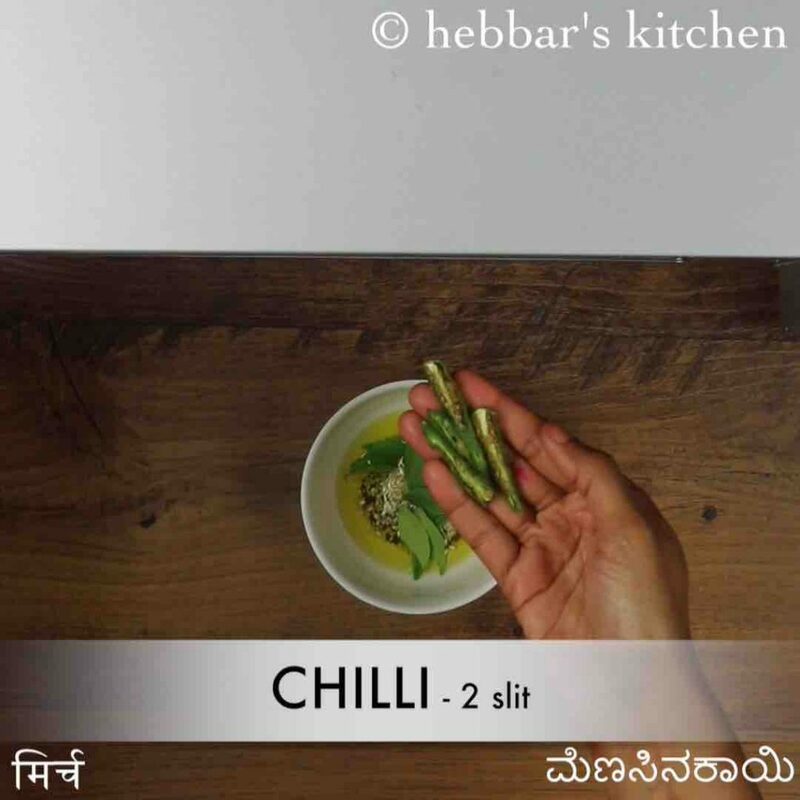 once oil is hot, add 1 tsp mustard, ½ tsp cumin, 1 tsp sesame seeds, few curry leaves, 2 green chilli and pinch of hing. mix well. keep again in microwave for 2 minutes on high power or till tempering splutters. 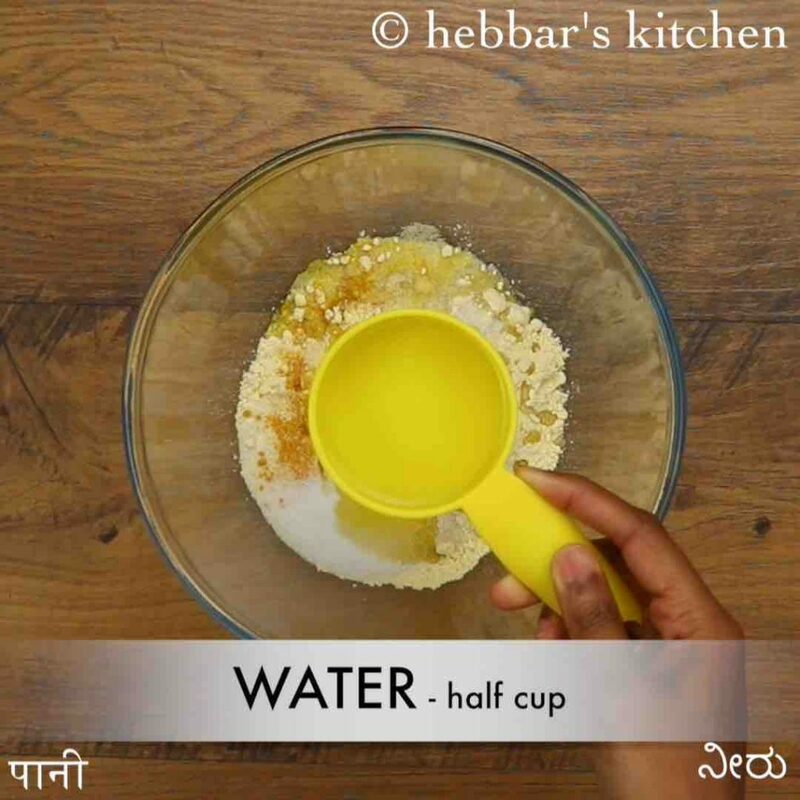 take out the bowl from microwave and add 2 tbsp water, 1 tsp lemon juice, 1 tsp sugar and ¼ tsp salt. mix well. keep again in microwave for 2 minutes on high power or till water boils. firstly, adding rava to dhokla batter, gives nice texture to dhokla. 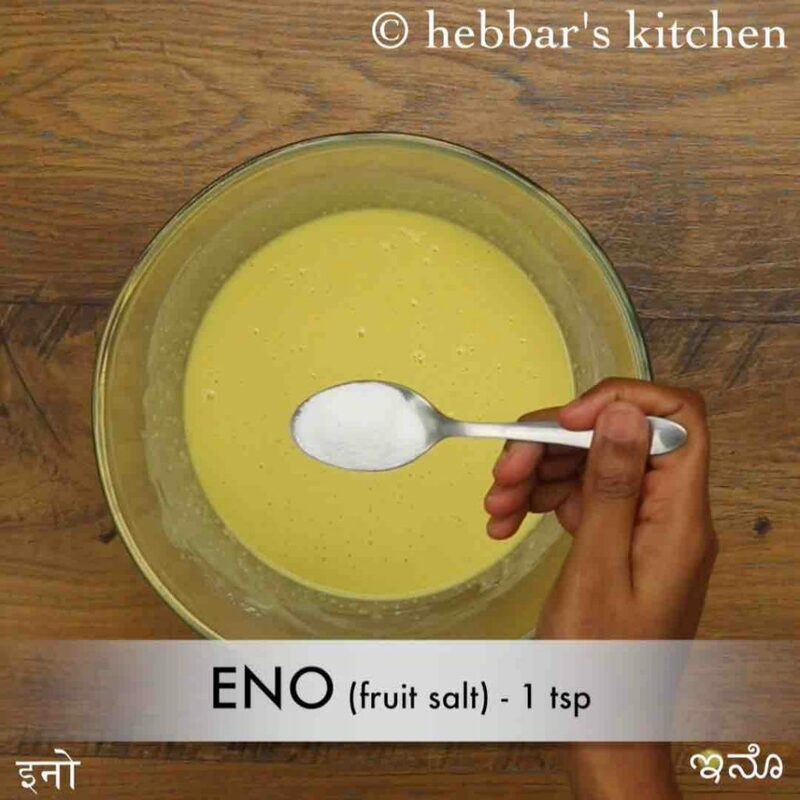 in addition, make sure to mix the batter well before adding eno fruit salt. furthermore, you can deep freeze these to serve it later. frozen dhokla can be easily microwaved and served later. finally, serve dhokla with green chutney or tamarind chutney garnished with fresh coconut.